Nag Panchami is dedicated to the worship of Naga, or Snakes, and is an important festival in India in Shravan month. Nag Panchami 2019 date is August 5. It is also observed on Shravan Krishna Paksha Panchami in parts of Rajasthan and Uttar Pradesh and this is on July 22. Nagas are worshipped in Hindu religion and snakes are always depicted with Lord Vishnu and Lord Shiva, two of the most popular Gods in Hinduism. Lord Vishnu lies on Snake Ananta in the milky ocean and Lord Shiva has snakes as ornament and this close association has deep symbolic meaning. Nag Panchami is a form of nature worship extolling the importance of the coexistence of animals and human beings. Nag Panchami is observed in eastern parts of India on all the fifth day in Ashar and Shravan lunar fortnights. 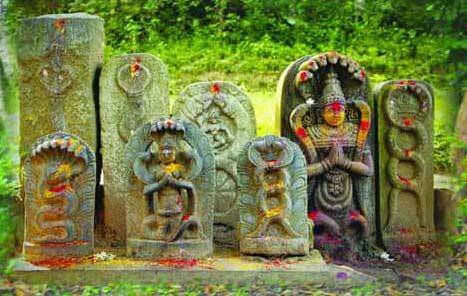 The most important Naga Panchami, which is observed through out India, falls on the fifth day of the Shukla Paksha (waxing phase of moon) in Shravan month. In Gujarat, the festival is observed 15 days later. On the Nag Panchami day, people worship the snake idols which are found in almost every village in India. Some people offer prayer near anthills. Prayers are also offered at Lord Shiva temples as snakes are the ornaments of Shiva. In many places, two images of snakes are drawn on both sides of doors using cow dung on this day. Five-hooded idols are worshipped in many regions. The idol of five-hooded snake is made using mud, turmeric, sandal and saffron. Manasa Devi, the snake goddess, is worshipped on this day in Bengal, Orissa and several parts of North India. 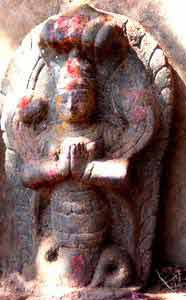 Special idols of Goddess Manasa are made and are worshipped. Nagaraja, Ananta and other Snake deities are worshipped on the day in other regions. People also observe Naga Panchami Vrata on the day – some Hindu communities fast during the daytime and eat food only after sunset. Some people avoid salt and deep fried food items on the day. Some people fast on Naga Chaturthi day, which falls a day before. Some Hindu communities in South India have an elaborate oil bath on the day. There is a belief that unmarried women who undertake Naga Panchami Vrat and do the puja to Nagas will get good husbands. Popular belief is that Lord Krishna defeated snake Kaliya on Naga Panchami day. The monsoon season is at is peak during the period (July – August) and snakes move out of their burrows, which are filled with water, and occupy spaces frequented by human beings. So it is widely believed that Naga Panchami is observed to please the Nagas and avoid snake bites during this season. Maharashtra is famous for Nag Panchami as people here feed snakes with milk. In most places snake charmers arrive with snakes on the day. Certain villages in Maharashtra are known to feed milk to poisonous snake. The amazing fact is that the poisonous snakes never bite. Unmarried women believe that praying to the Nag will help them in getting good husbands. Milk is offered to the snake idols on Naga Panchami. In some extreme form of worship people feed live cobras – offering milk and eggs to the snakes, especially to cobras near snake pits. Some people also decorate snake pits, known as Valmeekam or Puttu. Snake charmers also bring cobras to villages and towns which are fed with milk by devotees. Such practices should not be encouraged as it endangers the life of snakes. Forcefully feeding snakes, pouring milk into snake pits and bursting crackers should be discouraged. This only leads to the death of snakes. Snakes don’t drink milk but the practice has been encouraged by popular beliefs. Worship of Nagas is a constant reminder to humans to live in harmony with Nature. And the ideal way to worship Nagas is by protecting the forests and grooves that are home of snakes and other animals. What to do on Naga Panchami?